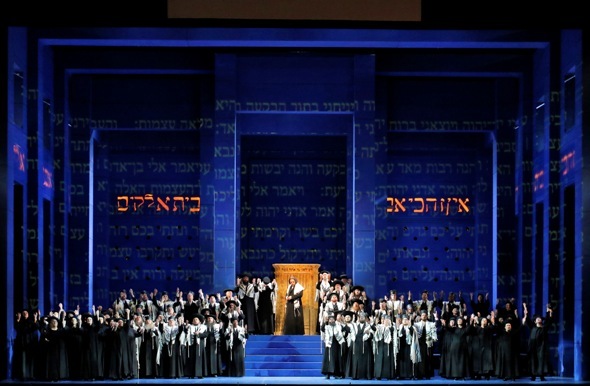 The best way to experience a performance of Verdi’s “Nabucco” is to think like an actor thinks.Stay in the moment completely. Don’t overthink the logic, the plot complications, the evidence of history. 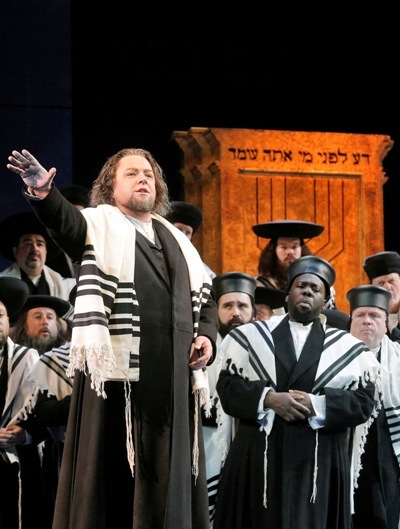 Avoid those traps and the musical impact of “Nabucco” — which is currently on the boards at the Lyric Opera of Chicago, where several mighty singing actors are doing terrific work – will thrill you to your bones. Verdi was 28 when he wrote “Nabucco,” his gifts exploding in chaotic flower. With every scenic turn, you’re in the emotional territory of the composer’s iconic later creations. Early versions of the lovers in “Aida” are here. Foretold are “Don Carlos'” vengeful, betraying Eboli – and King Philip, lost in thought, with cello. 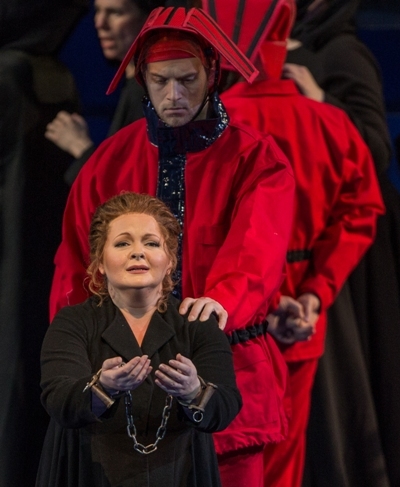 Cruel Rigoletto, pleading desperately for his daughter, is suggested. So is Macbeth at the point of madness. And lovely Desdemona, unjustly accused, bidding life farewell in “Otello.” Truly, one can suspend the reality checks for this effusion of melody and dramatic intensity, because the great moments are here in abundance. The story is set in biblical first millennium B.C. when the ancient Hebrews were conquered by the expanding Assyrian Empire, expelled from Israel and exiled inland to the city of Babylon. 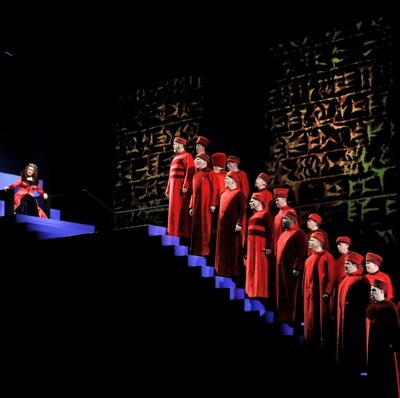 The Hebrews’ spiritual leader, Zaccaria, struggles to keep his exiled people whole, although they are under the menacing thumb of Nabucco the king (roughly based on Nebuchadnezzar II). Forbidden romance between a captor and a captive, and a bloodline rivalry involving Nabucco’s rightful successor, are the subplots in this saga. The anti-heroine Abigaille, as triumphantly sung by Russian dramatic soprano Tatiana Serjan, is as hypnotizing as Shakespeare’s Iago. An unpredictable actress who tests the edge of her ferocious powers, Serjan does not sing the role of the Babylonian princess, Nabucco’s supposed daughter, so much as she becomes the character. First she wins your sympathy as a royal child whose lowly birth has been kept a secret from her. Then she erupts full-tilt into a tirade of rage, high trills and two-octave leaps that’s not only a splendid technical feat, but one that keeps you guessing. Nothing comes as expected with Serjan as the stunned daughter who is about to be denied her ascendancy. Abigaille’s rival for the throne is the woman she had once thought of as sister, and who has also beaten her in love. In detail and in essence, you watch as violent emotions overtake this outraged princess as she decides what to do next. It is a stunning performance, both regal and raw. 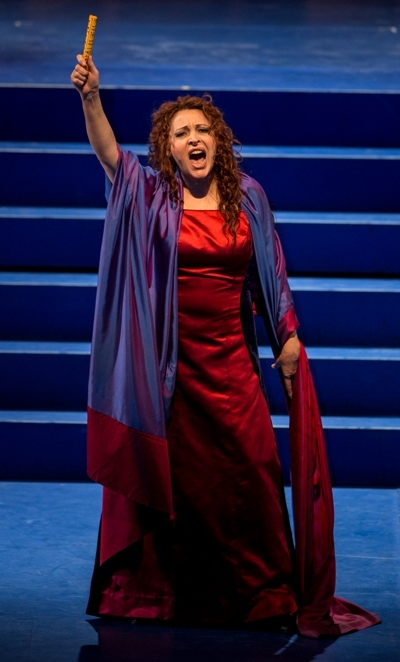 Serjan sang Puccini’s “Tosca” at the Lyric last season, but the previous performance that sticks most strongly in my mind as the equivalent of her tour-de-force here is another Verdi role, Lady Macbeth, which she sang under Riccardo Muti with the Chicago Symphony in 2013. 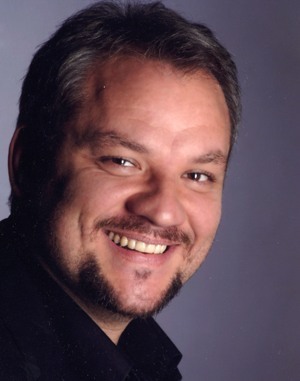 I found Serbian baritone Željko Lučić, the Lyric’s Nabucco, to be similarly electric when he played the abusive court jester Rigoletto in the recent Metropolitan Opera rat pack production set in a Las Vegas casino and Norge casino circa 1960. Lučić’s portrait of Verdi’s Assyrian king had a good bit of the very human Rigoletto in it, uneasy at first, coming into sharper focus toward the end of the second act when Nabucco declares himself to be God, his false bravado answered by thunderbolt in a divine smackdown. In Nabucco’s Lear-like subsequent struggle, Lučić was riveting as a crazed and humiliated man stripped of power, begging the defiant Agibaille for the life of his daughter Fenena. Lučić’s portrait of tragic self-recognition was the pivot that made Nabucco’s sudden resumption of power believable in the king’s final scene. The veteran Milanese conductor Carlo Rizzi was supportive of the individual singers and consistently engaged, conducting in authentic Italian style. If there is a small quibble, it was that he seemed to be gilding the lily during the famous chorus of the exiled Hebrews, “Va, pensiero,” where the extremes of loud and soft dynamics were so exaggerated as to lose contact with the heartsick, homesick words of Michael Black’s Lyric Opera Chorus, arrayed as they were in motionless tableau. As Zaccaria, the Russian bass Dmitry Belosselskiy showed why he is a rising artist to watch. He possesses a smooth, unforced voice, beautifully modulated and elegantly reassuring. American mezzo-soprano Elizabeth DeShong and Russian tenor Sergei Skorokhodov were appealing as the star-crossed lovers Fenena and Ismaele, each risking life and country for the other. Fenena’s final prayer, “O dischiuso è il firmament,” in which she envisions the heaven that awaits her, was a gem of poise. This production is quite long-lived, with an original directorial concept stemming from the 1990s by Elijah Moshinsky. His instructions were shelved for a fresh approach by Matthew Ozawa in his Lyric directorial debut, with new projections by Chris Maravich, the Lyric’s lighting director. Michael Yeargan’s original sets and Jane Greenwood’s original costumes also remain. 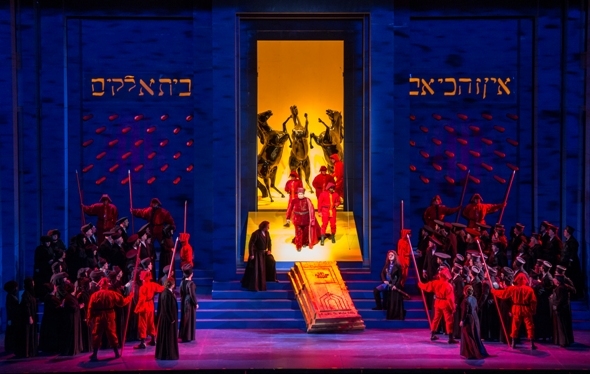 The sets are simple, blocky and color-coded – red for Babylon, blue for Jerusalem, although projected hieroglyphs and lettering enrich the surface textures. The costumes show the most signs of wear and are frankly inadequate for the Babylonian court and for its army. The impression they create is of Lemmings in red pajamas who move as one without apparent individuality or emotion. There were also two scenes of supposedly cataclysmic destruction, including Nabucco’s shattering of the altar of Baal, which were just plain feeble as modern special effects go. Apart from these 8-bit Atari moments, au courant for the ‘90s perhaps, Ozawa’s conceptual approach seemed not only lucid but timeless.